Get a FREE COMPLETE RESOURCE PACK to try out when you sign-up for our newsletter! Can you teach someone to think critically? Or is this some innate skill only a few can hope to possess? Some people are born great at something and some have to work hard at it. 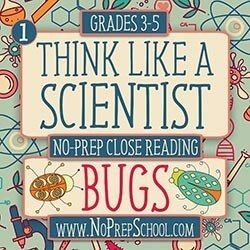 Whether your students were born to think like a scientist or not, they CAN learn to think critically with practice. Automatically Get Our Weekly Freebies! © 2018 by JA Huss and No-Prep School. All rights reserved.